In the coronary circulation, the right coronary artery (RCA) is an artery originating above the right cusp of the aortic valve, at the right aortic sinus in the heart. It travels down the right coronary sulcus, towards the crux of the heart. It branches into the posterior descending artery and the right marginal artery. Although rare, several anomalous courses of the right coronary artery have been described including origin from the left aortic sinus. right atrium (RA), right ventricle (RV), & 25% to 35% of left ventricle. At the origin of the RCA is the conus artery. 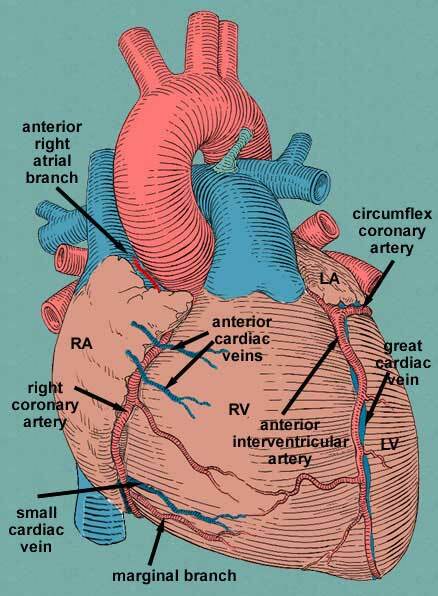 In addition to supplying blood to the right ventricle (RV), the RCA supplies 25% to 35% of the left ventricle (LV). In 85% of patients (Right Dominant), the RCA gives off the posterior descending artery (PDA). In the other 15% of cases (Left Dominant), the PDA is given off by the left circumflex artery. The PDA supplies the inferior wall, ventricular septum, and the posteromedial papillary muscle. The RCA also supplies the SA nodal artery in 60% of people. The other 40% of the time, the SA nodal artery is supplied by the left circumflex artery. 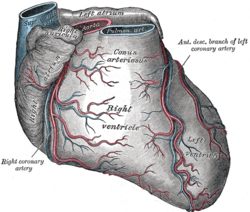 Coronary arteries (labeled in red text) and other major landmarks (in blue text). Right coronary artery is at left in the image. Base of ventricles exposed by removal of the atria. Diagram of a myocardial infarction. Aorta and coronary arteries at autopsy. The proximal portion of the RCA and its ostium can be seen at the lower left. ^ Angelini, P. (15 July 2014). "Novel Imaging of Coronary Artery Anomalies to Assess Their Prevalence, the Causes of Clinical Symptoms, and the Risk of Sudden Cardiac Death". Circulation: Cardiovascular Imaging. 7 (4): 747–754. doi:10.1161/CIRCIMAGING.113.000278. Anatomy figure: 20:03-04 at Human Anatomy Online, SUNY Downstate Medical Center - "Anterior view of the heart." Figure of the marginal artery of the heart - merck.com.